Welcome back to Tasty Thursday!! So I'm pretty sure I have a curse on me. I may or may not just use it as an excuse to not overexert myself around the house. But at this point, I'm thinking I am legitimately cursed. There are days when I am just on a roll around the house and get so much done. Little fun fact, I hate to clean. I'm actually the "messy" one in my marriage. Not that I am dirty and sloppy or anything. I just hate to clean. Especially dishes. However, there are rare occasions where I just can't stand anything to be messy and I'll go on a cleaning rampage. Or like I said, I will be on a roll getting so much stuff done that I will keep going. Long story short, my husband clearly had to help with the meatballs and he did a great job with it. These were tangy, sweet, and just all around great. I think they'd be perfect as an appetizer at a party too! Combine eggs, oats, milk, onion, salt, pepper, and garlic. Crumble pieces of ground beef over the top and then mix well. Roll into little balls and set into a foil-lined 13x9-inch pan. Bake at 375* for 30 minutes. Drain excess grease. Combine all ingredients into a saucepan and bring to a boil. Pour over meatballs (after baking) and then return to the oven to bake for another 20 minutes. 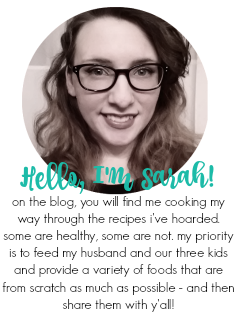 Thank you for hosting.Sarah :)You sound like you enjoy some of the same adventures I do in the kitchen! This week I shared White Chocolate Cherry Cookies. I'd love if you'd share one of your yummy recipes on my Saturday Spotlight Linky Party too. Have a great week! Thanks for Hosting! I love a good Party! Sorry to hear about your (mis)adventures, but it's always nice when someone else helps out, right? :P Thanks for hosting!